【APTX FOR HIGH FIDELITY AUDIO】Advanced audio codec produces richer, fuller sound while providing the convenience of wireless streaming; Supports A2DP, AVRCP, HSP, and HFP profiles. 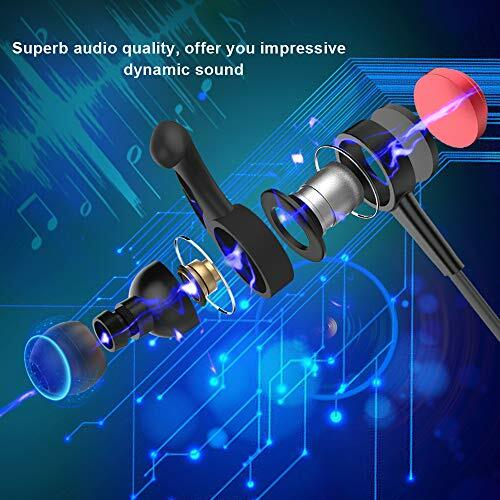 These headphones are compatible with most smartphones. 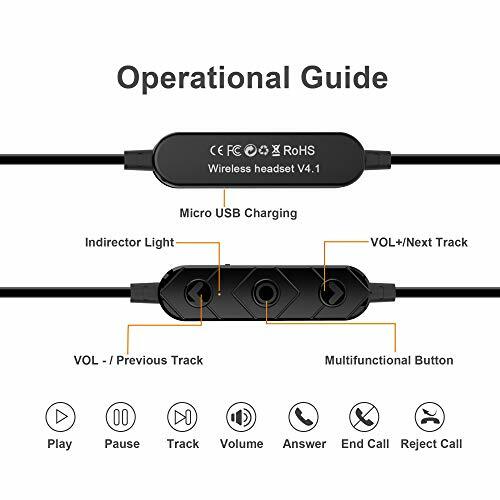 【BLUETOOTH 4.1+ CVC 6.0 TECHNOLOGY】Connect seamlessly with all Bluetooth enabled devices up to 33 feet away. 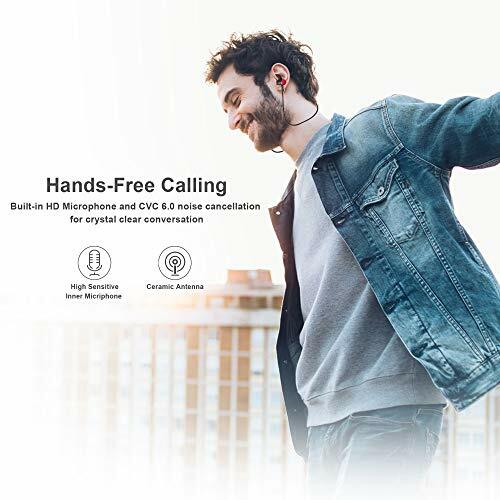 Noise cancellation 6.0 reduces outside noises, Offer you impressive dynamic sound; Enable clearer microphone sound when talking, you get high quality and hands-free phone conversation even on the street or inside shopping mall. 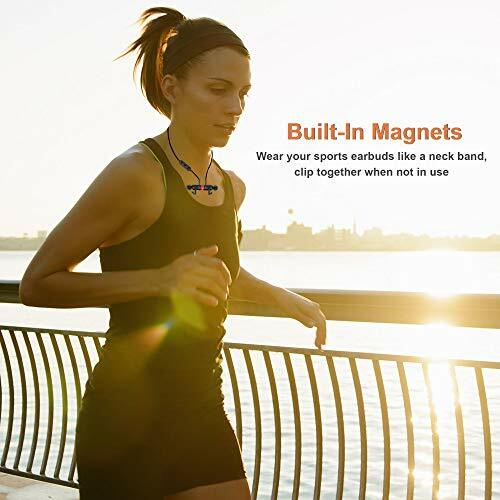 【BUILT-IN MAGNETIC DESIGN】Built-in magnets let you attach the two headphones together when not using, and wear like a necklace around your neck, a convenient way to carry around. 【UP TO 6 HOURS OF PLAYTIME】Bluetooth Earbuds enable you 6 hours of continuous talking / music time and up to 100 hours of standby with a single charge, so you can enjoy long lasting music and less time charging. 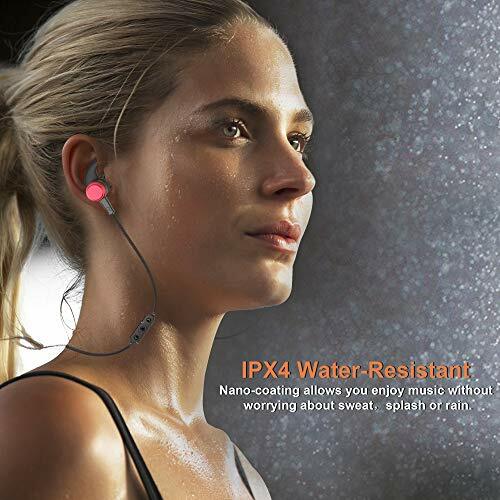 【IPX4 WATER RESISTANT& SWEAT RESISTANT HEADPHONES】Whether you're cycling in the rain or working up a sweat, IPX4 water-resistant shell and internal nano-coating provide a double layer of water protection. Lightweight and ergonomic design, customizable accessories with large, medium, and small size of gel ear tips; soft silicon ear hooks ensure comfortable and secure wear in even most intense workout. 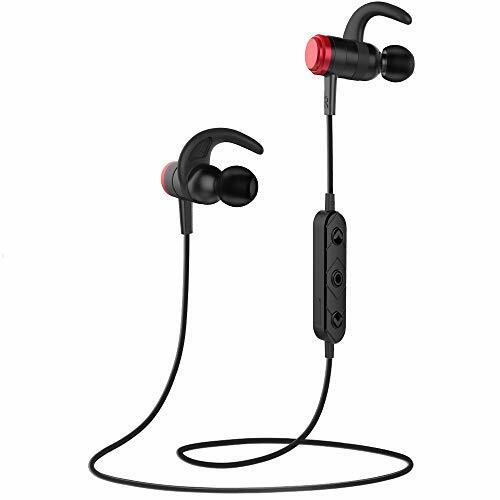 Ideal wireless earphones for gym, running, jogging, hiking, cycling and etc. This new kind of sport headset lets you enjoy great sounds on-the-go. When you are done with your music, simply attach the headphones together and wear like a necklace. Cut the cord and break away from wires with Bluetooth 4.1. You can enjoy excellent sound performance from this durable, lightweight and sweatproof headset. Work out and stay fit with clear, natural sound that drives you forward. Every Pwow product includes a 90 days money back & 12 month worry-free!